I love cooking. I enjoy chopping vegetables into neat dice. I’m partial to meditative stirring with a favourite wooden spoon. I don’t even mind washing pots, so long as I have a sink full of nice, hot, soapy water. I’m definitely not a gadget person. And I really, really love my Thermomix. It took me a while – they were about $1800 then, which is a lot of wooden spoons. But after a couple of months of regaling family and friends with riveting stories about one-minute sorbets, hands-free risotto, and foolproof custard I finally shelled out. That was it. I fell headlong into a love affair that blasted through the 18-month blahs and the seven-year itch and is still flirty and surprising. You don’t need a Thermomix to cook great food. But it is such a handy tool in the kitchen, ready to assist if you hate cooking or if you look forward to it, if you’ve never so much as toasted a sandwich or if you’re a dinner party wizard, if you’re a cake-lover or a #cleaneating evangelist. There are about 8 million Thermomixes in 65 countries, including more than 300,000 in Australia. However, I hear there are still Thermo-sceptics walking among us, yet to be bitten by the bug, so I’ll be glad to bust the most prevalent Thermo-myths. I’m a real cook. I don’t want a robot making my dinner. Thermomix owners don’t sign a contract promising to op-shop their knives and Le Creuset pots. While you’re cutting chives to preferred 1mm lengths your Thermomix could be making a delicious herb oil at 50 degrees, or blitzing rocket to make chlorophyll paste for tomorrow’s green smoothie, or steaming scallop mousseline for a fancy French entree. It can extend your cooking to places you may never have considered going and it’s fun along the way. There’s no getting around the fact that a Thermomix costs $2089. Even considering payment plans that are offered from time to time, that’s a hefty whack. But Thermomix is manufactured in France and Germany to high standards (and with First World wages). It lasts: I’ve seen plenty of 20-year-old machines still going strong. It can save you money: Thermomix owners can mill their own flour and make their own dips, yoghurt, icing sugar, ground spices, spice blends and muesli bars. Some people even make cosmetics and washing powders. Owning a Thermomix may also encourage you to buy fewer takeaway or restaurant meals. Thermomix isn’t available in shops; it’s sold by consultants who visit homes, put the machine through its paces and feed you the results. 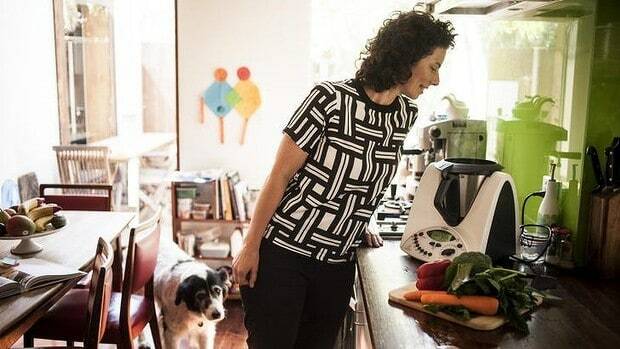 I admit that I didn’t think of myself as a home demo kind of gal but seeing – and eating from – a Thermomix in action is a great way to see how it might fit into your life. Demonstrations aren’t a hard sell and you get dinner cooked for you. Thermomix ladies (and a few blokes) tend to be nice, people-loving Thermo-evangelists who sell the machine because they truly believe it improves lives. If and when you buy, that same consultant is your point person for any questions or service calls. It can be. Making gram flour from chickpeas is louder than death metal, and quince paste can get a little rowdy too. On the other hand, you’re making really cool stuff so maybe just block your ears. My sister, a musician, squirms at the tones her Thermomix plays when it finishes cooking. Apparently it’s “not quite an octave” and makes her feel edgy. Again, block your ears? It will if you want it to but it certainly doesn’t have to. Thermomix can make crunchy salads (the two-second raw beetroot salad is a perennial winner) and creamy risotto with every grain of rice intact. It can cook lamb shanks to utter tenderness and steam a whole chicken too. Not really. The controls are pretty simple to master and you have a consultant on tap to help if you get stuck. 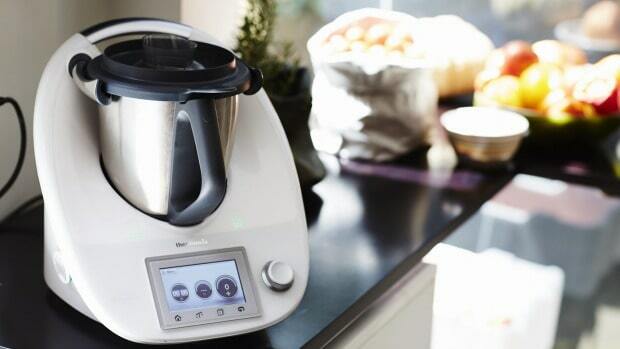 The current Thermomix model (released in 2014) offers guided cooking via a touchscreen, which makes it very easy to step through recipes. Thermomix has a 2.2-litre bowl so I won’t pretend that you can make 10 litres of chicken soup or bolognese sauce in it through some sort of Thermo-voodoo. On the other hand, you can chop all your base ingredients in the Thermomix, as well as make long-lasting stock concentrates, accompanying vegetables, bread doughs or condiments to augment your stock-pot or slow-cooker treasures. By using the Varoma (steamer attachment) it’s possible to layer dishes to feed a large group of people, too. Has everyone seen The Katering Show and their excellent Thermo-parody, in which one Kate makes risotto the traditional way and the other Kate makes it in the Thermomix? I suspect if you don’t like hot wet rice to begin with, the Thermomix probably won’t change your mind. But if you do, then you’ll love all the things you can do while the risotto is cooking itself. Get rid of everything else. The only thing you really need is a coffee machine, a toaster, a kettle and a Thermomix. And if it’s a choice between the kettle and the Thermo, then ditch the kettle because the Thermomix can boil water. Still cramped? Put the Thermomix on the floor. I did it while we were renovating and fed the family for a month. First published in The Age, 29th March, 2016. Subscribe to master your Thermomix and cook with confidence and joy. Subscribers receive access to the full library of recipes and videos, plus a brand new video every week. Learn from Dani and her special guest chefs and cooks. Be inspired, entertained and informed!